THE REVIEW: Dinosaurs are making a big comeback this year with the release of Jurassic World and the forthcoming Pixar film The Good Dinosaur in November. If the $200+ million opening weekend box office is any indication, the dinos are what moviegoers want, and luckily, director Colin Trevorrow does a damn fine job of creating a gripping and entertaining blockbuster, laced with nostalgia for the original Jurassic Park from 1993. When I saw the 3D re-release of Jurassic Park back in 2013, I lauded the film and was blown away by how great it was to see one of my favorite movies on the big screen. I delved into some actual specifics (like the story and action), but most of my review centered around the nostalgia from seeing a classic in theaters again. It brought up the emotions and feelings I had from when I first saw Jurassic Park and hearing John Williams’ score sweep through the surround sound gave me goosebumps. Part of the reason I enjoyed Jurassic World so much is that it brought back similar memories. Little things like the John Hammond creation lab, to the iconic score, to the decaying banner that used to hang in the welcome center. Trevorrow certainly pays lip service to fans and knows just how to evoke the original without overdoing it and making it cheesy. Jurassic World builds off of Jurassic Park and will most definitely appeal more to fans than non-fans. That sort of comes with the territory for reboots of age-old classics. But Jurassic World isn’t just for old fans, it is also for a new generation of people to jump in and partake in the wonders of seeing an extinct species grace the silver screen. Jurassic World is what Jurassic Park would have been had it been created in 2015. Yes, the visual effects were incredible for it’s time (a life-like T-Rex created with computers!) but things have gotten even more photorealistic, bigger, and more extravagant. It’s funny, because one of the themes/messages of the film is against the rise of excess and lavishness and yet that only helps the film succeed. You would think Owen (Chris Pratt) is right when he says, “They’re dinosaurs, wow enough,” in response to Claire (Bryce Dallas Howard) explaining the new genetically-modified Indominus Rex. And yet, seeing the new creature and the gorgeous, expansive, and high-tech theme park (a giant leap ahead of John Hammond’s original design in the first film) can’t help but get your imagination running wild about if Isla Nublar actually existed. Pretty visuals might be a big draw, but it does come down to story at the end of the day. Plot-wise I could probably pick out a lot of little annoyances and nit-picks but I’m not going to dwell on them that much. My biggest area of complaint resides with the Mitchell brothers, Zach (Nick Robinson) and Gray (Ty Simpkins) and the fact they don’t really have much to do — even less than Lex and Tim did in Jurassic Park, which is saying something. But even with the brothers poorly incorporated and Claire somehow traversing the park in high heels the entire movie, there’s a reason the story still worked for me and that is the characters. Everyone loves Chris Pratt regardless of what film or show he’s in, and Jurassic World is just another to add to the list. It’s like he was born into the character of Owen which helps us relate to him that much more and gives us a great entryway into Jurassic World the theme park. Bryce Dallas Howard also brings an incredible amount of depth to a seemingly bland character. Her growth over the course of the film from the strict businesswoman who only cares about the numbers and investors to a leader who recognizes the value Owen brings, being able to connect with the velociraptors the same way you might connect with a dog or cat. 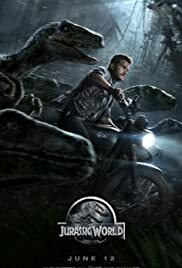 THE TAKEAWAY: While Jurassic World is not the best film there is, and normally I would rate it four stars out of five, it is hard to beat in the pure entertainment, spectacle, and fun categories. You easily get your money’s worth seeing this in a theater on the big screen and is a perfect film to watch at almost anytime you can think of. Story or plot issues may exist, but the characters lessen their ill-effects and the action and stunning visuals all but negate whatever is left. You will probably enjoy the film more if you’ve seen and are a fan of Jurassic Park as it does bring back a lot of nostalgia, but for those new to the franchise you won’t be disappointed. I urge you to go join the hoards of people who helped Jurassic World break the opening weekend box office record.